In the last installment we saw how flang splits the input in tokens. Once we have the tokens identified we need to parse them. In the last chapter we saw how the driver handles the compilation and how it invokes flang1 and flang2. In this chapter we are going to start with flang1. In the previous installment of this series we saw basically how to install flang and we ran a simple smoke test. In this post we will see a high level overview of what happens when we compile a Fortran program using flang. We will also compare it with what usually happens with clang. Flang is an open source project to create a Fortran compiler for LLVM. It is based on NVIDIA/PGI Fortran and it has been released under Apache License 2.0. In this series we will do a walk-through the code of this compiler and how it has been integrated in the existing LLVM infrastructure. This is a small anecdote of something that happened me the other day. In the last chapter we saw how to call a function. We mentioned a special memory called the stack but we did not delve into it. Let’s see in this chapter how we can use the stack and why it is important in function calls. I started using Telegram a few years ago. Most of the time I don’t use it much to have 1 to 1 conversations but rather chat in a small group of friends which I’ve known for a while now. 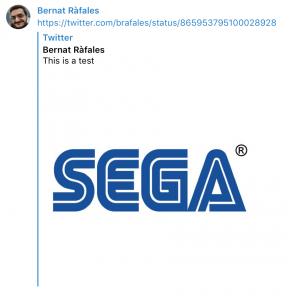 Every now and then, we share some links to Twitter on that group, and unfortunately the Telegram official clients preview mode don’t support previewing Twitter messages with more than one image. Which is not ideal, as sometimes the message doesn’t make much sense when only one of the images is displayed. Turns out I’ve been learning some Go over the last few months as well, so I wondered if I could write a small Telegram Bot to help me with that. I needed something to which I could send a Twitter link, and gave me back either the default Twitter preview in Telegram, or a custom made one with all the images of the message, in case there were more than one. We saw in the previous chapter what is the process required to build a program from different compilation units. This process happened before we obtained the final program. The question is, can this process happen when the program runs? This is, is it possible to dynamically link a program? Today we will toy around a very simple optimization in clang and discuss a bit about separation of concerns when optimizing code.